TOWARD A SUSTAINABLE LONDON- A Free Public Presentation. 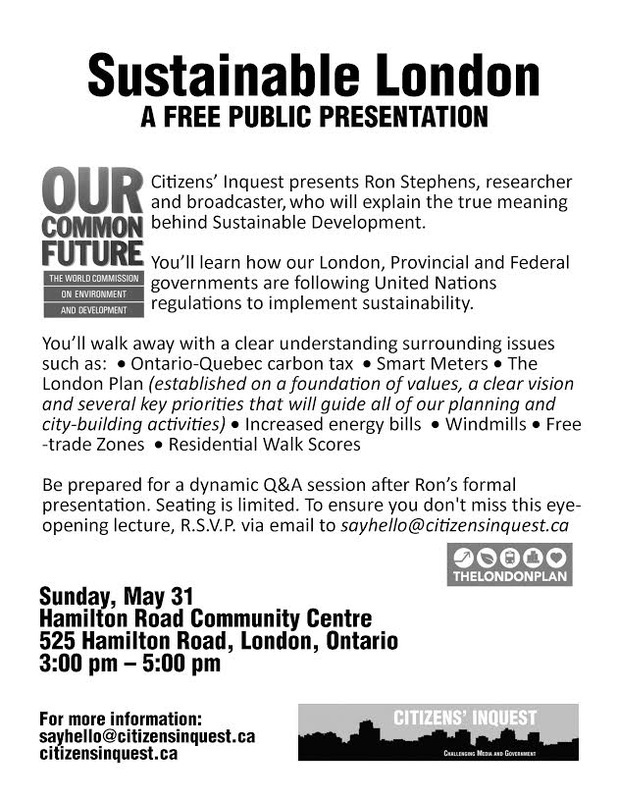 Citizens’ Inquest presents Ron Stephens, researcher and broadcaster, to explain the pitfalls of sustainable development, including windmills, smart meters, carbon taxes and other issues. An extended Q&A period will follow the speech. Sunday, May 31 at the Hamilton Road Community Centre, 525 Hamilton Road, from 3:00 - 5:00 pm For more information read Ron's brief exposé on sustainable development below. These days it seems every town, city, and municipality has a “Plan” stating their commitment to become a “sustainable, environmentally friendly community.” Considering the opposite of sustainable is unsustainable and the idea of living in an environmentally unfriendly community conjures up all kinds of unpleasant thoughts, who could be against such an honourable plan? On the surface a “sustainable, environmentally friendly community” sounds like something we should all strive to create for our children, grandchildren, and ourselves. You can google any community in the Province of Ontario and find the “Action Plan," "Community Plan," "Municipal Plan,” or a similarly named "Plan". Regardless of the plan's name, the goal is the same: to stop climate change/global warming by: reducing CO2 emissions, and water and energy consumption; planting more trees; and developing high density housing, transportation solutions, bike paths, and watershed projects. However, how is it possible all communities identify the same problems and endeavour to implement the same solutions simultaneously? All sustainable community plans begin with a “Vision.” Is a yet unnamed virus the cause of these visions? Not a virus as most understand the word, but something contagious is definitely in the air and it's affecting the direction of every community in Ontario, Canada and globally. The first step in a sustainable community plan is to ask for input from members of the community. You may have received a call, filled out a questionnaire or attended a meeting on the subject. Your council, local media, and many local groups have much to say about the positives of “sustainable development.” Are they sincere or is there something else at play, and does the sustainable community plan actually originate in the community? The answer to both is yes and no. While the “Plan” is a local level plan, it is more an exercise of filling in the blanks of a supplied template than actually creating a plan from scratch. While many in the community embracing the idea of sustainable development are sincere, they lack a full understanding of what it is they embrace. Municipalities, which contain our villages, towns, and cities, are a creation of the Province and therefore take their marching orders from the Province. A councillor explained it this way: “We have to do as the Province says because we are in the child position.” The Province (acting as the parent in this example) requires all municipalities to create a sustainable community plan based on provincial guidelines, whether they want to or not. The latest update from the Province is the Provincial Policy Statement 2014 issued under section 3 of the Planning Act. It replaces the Provincial Policy Statement issued March 1, 2005. The template for your local community plan did not originate from the Provincial or Federal government. It is a global template originating from the UN and is far more nefarious than most can contemplate. The term "sustainable development" originated from the Gro Brundtland Report (a.k.a. Our Common Future), “Sustainable development is development that meets the needs of the present without compromising the ability of future generations to meet their own needs.” Gro Brundtland is the ex vice president of Socialist International. In 1992 Brian Mulroney signed Canada onto UN Agenda 21, which is the guide book, spawned from the Gro Brundtland Report, used to implement sustainable development across this nation and around the world. All municipalities have a copy of Local Agenda 21. All levels of government have been using this guide book since 1992. Everyone is encouraged to learn more about sustainable development and UN Agenda 21. Language used in sustainable community plans and most UN documents is full of ambiguous catch phrases and fuzzy language- beware of both. Sure, we all want clean air, food, and water; a home, and a decent education. However, do we want an unelected body like the UN dictating how we live in our local communities? Google "World Commission on Environment and Development," the "Gro Brundtland Report," and the "United Nations Conference on Environment and Development" for more information on the origins of "sustainable development" and UN Agenda 21. Read both your local community plan and the Provincial Statement to get a broader understanding of how sustainable development is being implemented here at home. - Ron Stephens is a respected researcher and broadcaster. He ran as an independent candidate in the 2007 Provincial election and in the municipal election of 2010. He was an invited speaker at the all-party committee on renewable energy in London, Ontario.